Winter Weather Got You Down? Time for Some At Home Pampering! Baby it's cold outside! It's a whopping -10 here in the Twin Cities. The East is still looking at mountains of snow to get rid of, and folks in the South have been dealing with freezing temps, and icy roads. It's enough to make a mamma want to holla! For some of us, it would take a blizzard to keep us inside. Instead of losing your cool on this cold, winter day, take some much need time for yourself. Take a me day! candle that smells bright and citrusy. *Pour yourself a hot cup your favorite tea . Don't gulp it down, just sip it and enjoy it. Or better yet, make some hot lemon water. *Start the day with a thanksgiving prayer and catch up on your bible reading. Someone doesn't have shelter in this wintery mess. Be grateful. *Dust off that workout video that you used to love exercising to. Or, turn on YouTube! They have great free workouts that get the blood pumping. The endorphins you get from moving will cure those winter blues. *Draw a nice, warm, bath. Be sure to add bubbles or Bath salts to make it more luxurious. *Treat yourself to a body scrub while you're soaking. 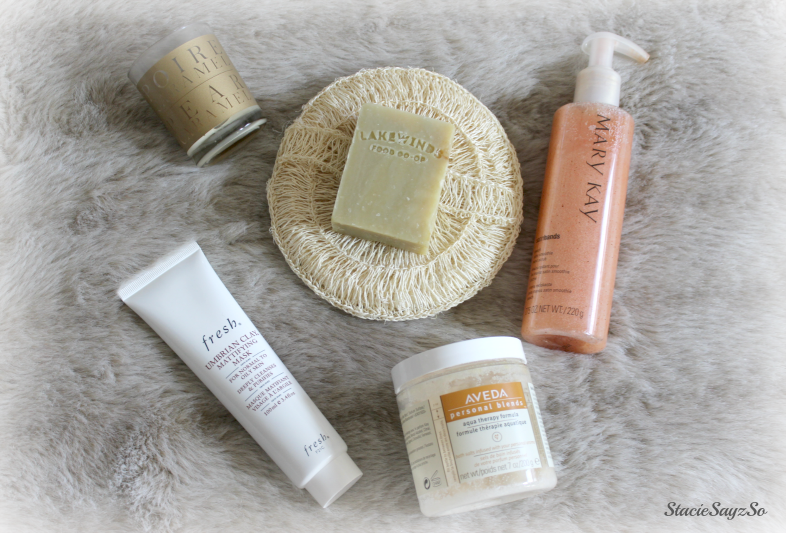 Exfoliate your skin from head to toe. Mary Kay has a nice scrub that's sweet and peachy. *Shave your legs! Yes, girl, it's about that time. I use Whish when I want a smooth, clean shave. You love how silky your legs feel. *Paint your nails. Play with that new polish you've been wanting to try. Head to Pinterest and or Instagram and try out some nail art. You don't need anywhere to go, just paint them for you! End your day with the warmth of a fireplace, if you have one. Grab your favorite magazine or a book you haven't had time to read. If you prefer, make it a Netflix or Hulu night and catch up on your TV shows. What are your tips for taking a me day? I love this idea. I definitely could use some at home pampering!! I'll definitely be using some of your tips today!! Thanks, girlie! A little diy tlc is the best! keep drinking that tea, girl! It's so comforting during the Winter. Great ideas. I need a little pampering beauty day. These are all great ideas for relaxing on a me day. I like to read magazines to while watching tv and getting a nap in is always great. Ooh, a nap sounds good right now and can do wonders for your body. LOVE these ideas! I definitely enjoy winter weather ONLY to enjoy downtime. Right! I enjoy the snow in limited amounts as well. It doesn't take much to keep me inside. I pretty much stay inside when the temp is below 50. I definitely use that time to polish my nails (and should probably shave too LOL). 50? Girl, that's a heat wave here! Everyone would be walking around in shorts, no joke. Love those tips Stacie! I need to take so more me time.